This Physics book is written in a form that is easy to understand for high school and college students, as well as science buffs. It is based on lessons from the School for Champions educational website. 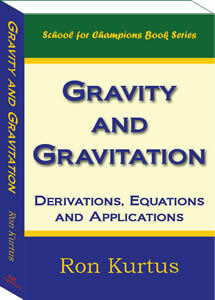 The book explains the principles of gravity and gravitation, provides deviations of important gravity equations and give applications of those equation. It also compares the different theories of gravitation, from those of Newton to Einstein to present-day concepts. Gravity and Gravitation is 534 pages long and has over 115 illustrations that clarify the concepts. There is also a short quiz at the end of each chapter, to help verify your understanding of the material. The book is a great supplement for Physics or Physcial Science classes. Non-students will also enjoy reading the book.